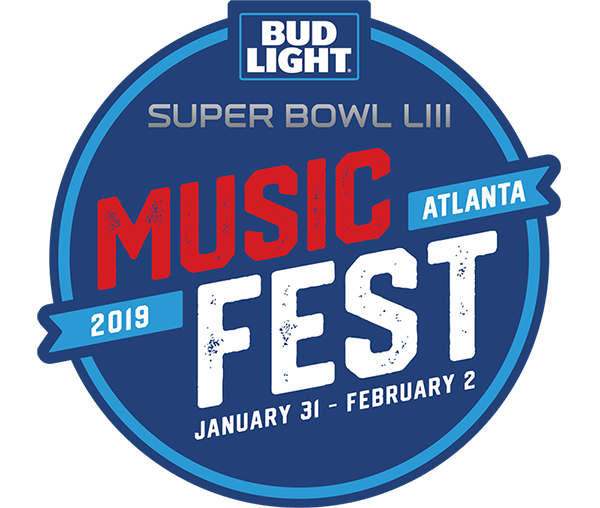 November 7, 2018 – On Location Experiences, the official hospitality partner of the National Football League, and Bud Light, the official beer sponsor of the NFL, today announced the launch of the first-ever Bud Light Super Bowl Music Fest. The three-night festival will give football fans and the entire city of Atlanta an opportunity to enjoy the artists they love from Thursday, January 31 through Saturday, February 2 at Atlanta’s fully transformed, premium, sports and live entertainment venue, State Farm Arena. 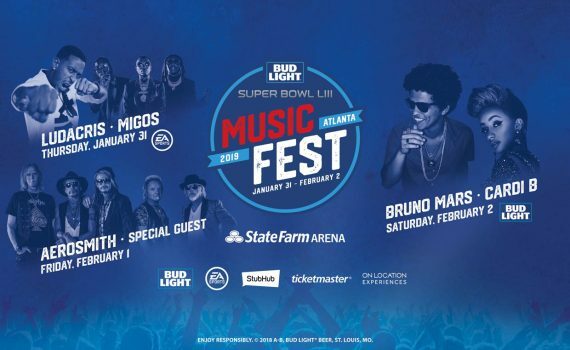 On Saturday night, the Bud Light Super Bowl Eve concert will feature one of the world’s biggest pop artists, Bruno Mars, and one of the top female rappers in the game, Cardi B. Friday’s lineup includes Rock and Roll Hall of Famers Aerosmith and soon-to-be-announced special guest. Electronic Arts Inc.’s EA SPORTS BOWL will once again serve as the unofficial kickoff to the biggest weekend in the NFL season Thursday night with a Welcome to Atlanta Showcase that features Atlanta hip-hop legend Ludacris and friends, as well as a special Quality Control Music showcase featuring rap supergroup Migos, Lil Yachty, Lil baby and more. In addition to top-level talent spanning a multitude of genres, the festival will feature celebrity and athlete appearances. 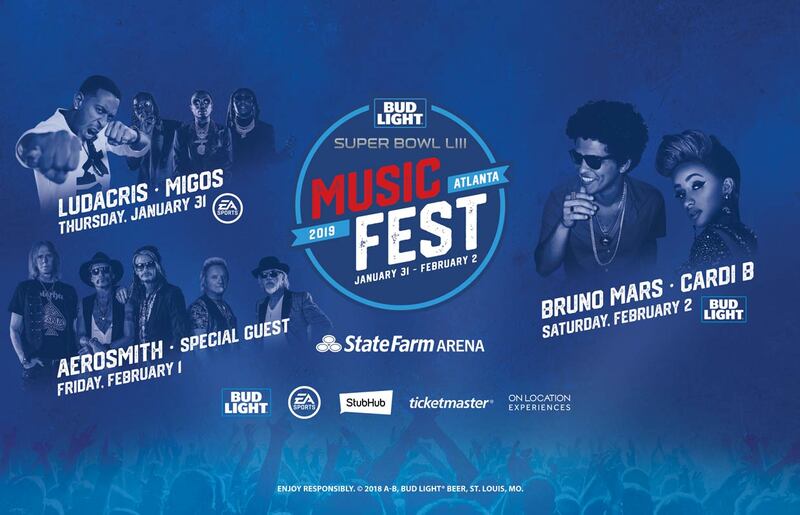 Additional presenting partners for the Bud Light Super Bowl Music Fest are StubHub and Ticketmaster. An array of premium seating offerings, including suites and club packages, will be available, also featuring options for premium hospitality. For updates, visit https://www.superbowlmusicfest.com. The Bud Light Super Bowl Music Fest is executive-produced by On Location Experiences and SYNERGY Productions, LLC with production support from Live Nation Urban. 11x GRAMMY Award winner and 27-time GRAMMY Award nominee Bruno Mars is a celebrated singer, songwriter, producer, and musician who has sold more than 180 million singles worldwide, making him one of the best-selling artists of all time. Recently, his critically acclaimed and RIAA certified double-platinum album 24K Magic marked his highest first week sales debut, remaining in the Top 10 on the Billboard 200 for an impressive 44 consecutive weeks. The lead hit single “24K Magic” is certified four times Platinum by the RIAA. Mars’ six-time platinum certified single “That’s What I Like” recently climbed to No. 1 on the Billboard Hot 100, marking his seventh Hot 100 chart-topper and his first No. 1 on the Hot R&B Songs chart, where it remained at the top-spot for 19 consecutive weeks. Mars is the first artist to have two songs spend 24 or more weeks in the Hot 100’s Top 5 (“That’s What I Like” and “Uptown Funk”). He is the only artist in the past year to have both a four-time and six-time platinum single from the same album. Also, Mars is one of the few artists to have written and produced all of his No. 1 hits and has had a No. 1 song on the Hot 100 from each of his first three studio albums. With seven Hot 100 No. 1’s, Mars is ranked No. 1 among male artists with the most Hot 100 No. 1s for this decade, extending his lead over Justin Bieber, Drake, Eminem, and The Weeknd. Mars has been traveling the globe on his massive 24K Magic World Tour, which sold more than 1 million tickets in a single day. Rap superstar Cardi B’s debut album “INVASION OF PRIVACY” was released this year to universal acclaim from music critics and marked the first female artist to achieve a Gold certified album on the day of release. Undoubtedly this years’ greatest hip-hop phenomenon, Cardi B made history with the release of her breakout hit “Bodak Yellow.” The now 5x platinum smash hit spent three historic weeks at #1 on Billboard’s Hot 100 – the first solo #1 by a female hip-hop artist in nearly two decades. Furthermore, “Bodak Yellow” is the #1 certified debut song in the last year and is one of the Top Ten certified songs released in the past year. The release of “Bartier Cardi” and Bruno Mars’s “Finesse (Remix) [Feat. Cardi B],” the latter of which is now certified 2x platinum, Cardi B made history yet again, surpassing Beyoncé as the first woman to have five top 10 singles simultaneously on the “Hot R&B/Hip-Hop Songs” chart. Cardi B has received a stunning series of top honors, among them two GRAMMY® nods (for “Best Rap Performance” and “Best Rap Song”), two BET Awards nominations (for “Best New Artist” and “Best Female Hip Hop Artist”), a Soul Train Music Award, and five 2017 BET Hip Hop Awards including “Single of the Year,” “Best New Hip Hop Artist,” “Hustler of the Year,” “Made-You-Look Award,” and “Best Mixtape.” Cardi B received the most nominations for the 2018 MTV Video Music Awards with 12 mentions, winning three awards. She also tied with Drake for the most nominations at the 2018 American Music Awards. She won three AMAs and performed at the ceremony. Belcalis Almanzar, known professionally as Cardi B, is an American rapper whose hometown is New York City. Born and raised in The Bronx, she first attracted attention for discussing her career as a stripper on social media; coupled with her “no filter attitude”, she became an Internet celebrity through Instagram. Cardi B has been featured on the cover of People Espanol, Cosmopolitan, Rolling Stone, The New York Times Magazine and many more. On the cusp of their 50th anniversary and having sold over 150 million albums worldwide, AEROSMITH–Steven Tyler (vocals), Joe Perry (lead guitar), Brad Whitford (guitar), Tom Hamilton (bass) and Joey Kramer (drums)–are a living piece of American music history. They are the recipients of countless awards including four GRAMMYs, eight American Music Awards, six Billboard Awards and 12 MTV Video Music Awards among many other honors including an induction into the Rock and Roll Hall of Fame. Proving that they can cross genre-boundaries with ease, these rock legends have even taken home a Soul Train Award for Best Rap Single for their remix of Run DMC’s “Walk This Way.” With scores of multi-platinum albums, AEROSMITH continues to inspire generations to get their wings, get a grip and just push play. On Location through CID Entertainment & Future Beat also partner with numerous artists and music festivals across genres, including Imagine Dragons, Metallica, Luke Bryan’s Crash My Playa, Electric Daisy Carnival, Migos, Post Malone, Iron Maiden, and J. Cole. On Location’s operations include: Anthony Travel, CID Entertainment, Future Beat, KreateInc, PrimeSport and Steve Furgal’s International Tennis Tours.